The DNA does not lie and upon commercial ancestral DNA testing the people who appear as a genetic match to you share a common ancestor with you, it is merely a matter of when that shared ancestor once lived; and as a rule the more markers (or mutations) that two people share the more recent that shared ancestor once lived. In addition, if you have enough matches you will begin to notice patterns in your DNA results; a particular surname that reappears frequently among your matches, or a common ancestral location recorded by their earliest ancestor. Hence the detail revealed by your genetic relatives upon YDNA, mtDNA or Autosomal DNA testing are NOT RANDOM; they reflect the relationships that developed in specific locations among ones various ancestral lines. In 2010 YDNA STR testing at FTDNA had reached a critical threshold (maybe 400,000 samples). It was at that point that I noticed that in my YDNA results that I always matched males named Bowe/Bowes, Carroll, Dooley and Flanagan (Irish-associated surnames which I realised were becoming too frequent to be ignored!). When I analysed where Bowe/Bowes, Carrolls, Dooleys and Flanagans where found in early Irish census data it identified County Laois in the Irish Midlands as their common area of association. The logical conclusion was that those surnames had arisen among a tribal group of related males living in County Laois an estimated 1,000 years ago (when surnames first appeared). Subsequent independent DNA testing of Bowe and Bowes in County Laois confirmed the location (they were a close YDNA match to me). Conclusively confirming my Bowe Laois origin. 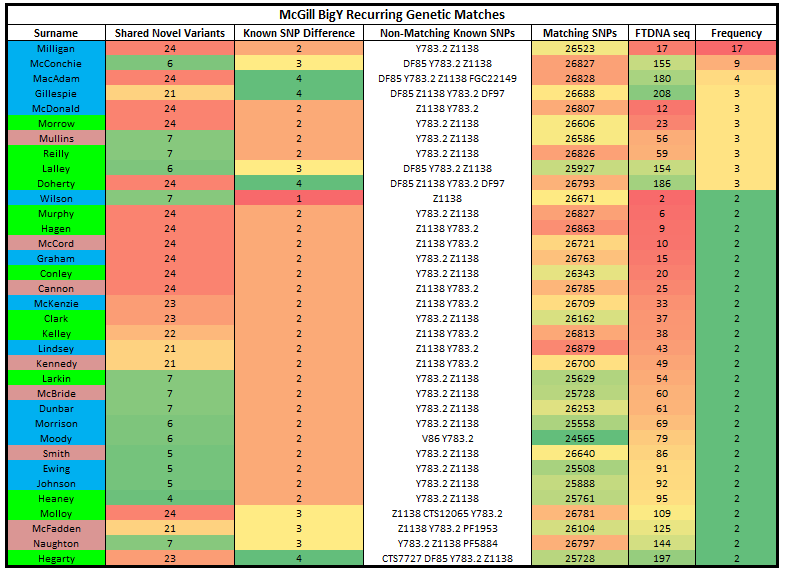 If you carry the M222 marker then BigY DNA testing has also reached that critical threshold; with numerous surnames now recurring throughout the one's BigY matches. One can now identify the closest most frequent BigY surname matches and begin to reconstruct one’s paternal ancestral journey! 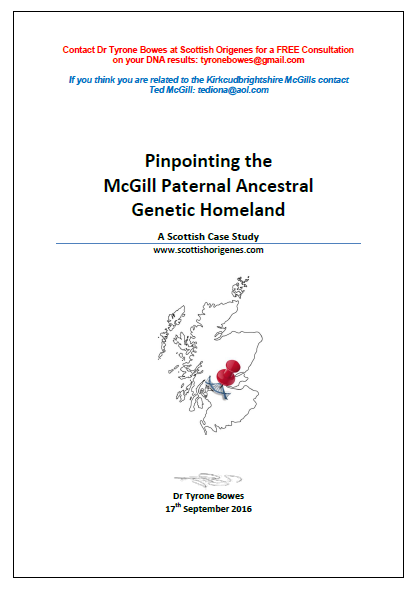 Mr Ted McGill (email: tediona@aol.com) is the Administrator of the McGill FTDNA Surname Project, whose family tradition holds that his McGills were Scots. His earliest ancestor being a James McGill who came to the American Colonies in 1775 and fought in the Revolution. McGill (or Magill) is one of those surnames which can be of Irish or Scottish origin. 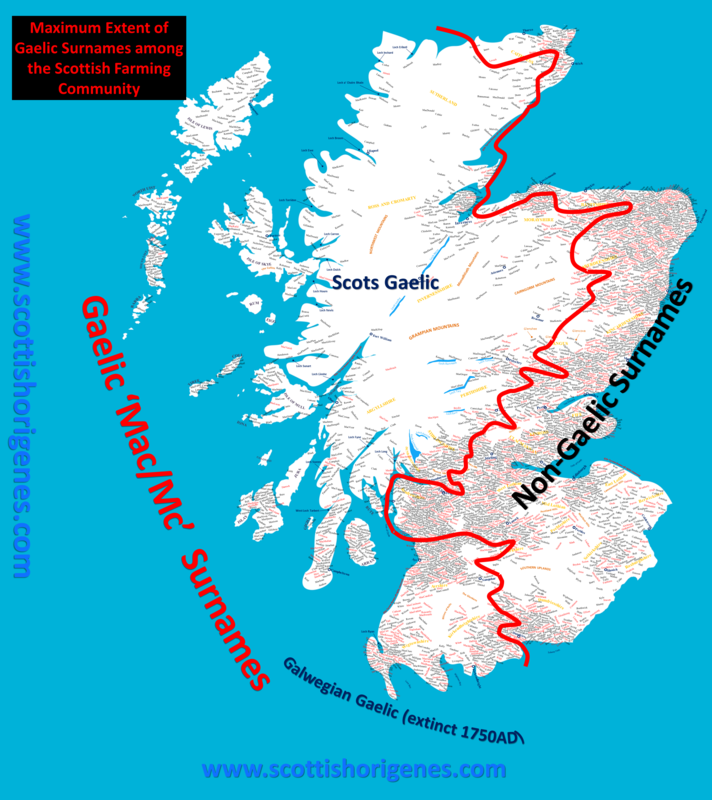 Mac or Mc surnames are exclusive to Ireland and parts of Scotland (see attached image), within Ireland they predominate in the North while in Scotland they dominated the Highlands and Islands together with Southwest Scotland. The complete McGill Case Study can be downloaded and studied by clicking here. It is no surprise therefore that upon BigY testing Mr McGill's closest and most frequent surname matches were completely dominated by exclusively Scots, exclusively Irish, or surnames that can be of either Scots or Irish origin (see attached image). In addition those surnames were NOT RANDOM; 50% of the surnames that appeared in Mr McGill’s BigY results recurred among his BigY matches, by grading those surnames according to frequency, and then their position at which the surname appears among his BigY results (as judged by FTDNA) it reveals that Scottish surnames dominated his closest matches while more distant recurring matches are dominated by Irish surnames; this indicates a more recent paternal ancestral link with Scotland but an earlier link with Ireland (no surprise given his M222 marker). Those surnames can then be mapped to reveal where in Scotland his paternal ancestor settled and where in Ireland his distant genetic relatives spread! The full story of the spread of M222 can be read here. As ever contact Scottish Origenes here to find out what DNA test is suitable for you or for a FREE CONSULTATION on your DNA results.